Games to Increase Your Typing Speed! Have you ever wanted to type faster? Or maybe you just want to be more consistent and make less mistakes as you type? Typing is a very important skill to have in today's world since many things use computers now. I also think that it would help with programming since you would be able to code faster. So here are a few ways to increase your speed and skill through typing games! So in the past, I always thought that I was a pretty fast typer. I had taken typing in middle school a long time ago and played many games on the PC so I thought I was a very fast typer. But I was typing out a measly 60 words per minute, and felt that I could improve so I went out to find a few games or websites that could increase that skill. The first thing I found was TypeRacer.com. This is probably the most efficient and slightly entertaining way to increase your type speed. How it works is you race against other players to see who can type out a paragraph, which honestly can get a bit frantic at times if you get competitive with it. What you type out in the races are quotes from books, movies, songs, and just about anything that is famous and there is quite a large selection of quotes to race with. But unfortunately many times you will end up seeing the same quote. This is the most efficient because it actually forces you to use punctuation, which is a crucial part of typing. Unless you want to look like a fool of course. I've been spending time on this site racing whenever I have downtime, or I'm just talking with people here on TAY. It honestly is a lot of fun, and will increase your type-speed if you put time into it. And you can see the results because it will show you your average type-speed if you register and create an account. This way it is easier to see that you have improved. The next game I found thanks to stumbleupon. The game is called Z-Type and is a bit more fun than TypeRacer. It is a game where the words you type will destroy incoming ships and missiles via the style of Space Invaders, just minus the moving between covers and ships lowering and reversing direction the entire time. The game features a normal and extreme difficulty. On normal I was able to get to around wave 30 before I messed up and the words destroyed my ship. Thus, I decided I was already ready for the extreme difficulty and went to try it out. Extreme difficulty is exactly what it says it is, extreme. Words are longer, missiles move faster, and the difficult ships show up in the first wave. In that difficulty the farthest I have made it so far was around wave 16, which by the time I got there I was already having much difficulty to keep up with the oncoming flow of words. The problem with this game is that it does not use any punctuation as well as its estimate of your words per minute is not very accurate. This is due to the occasional moment when there are two words on the screen that start with the same letter. When you hit that letter it decides that you are targeting the large word that is farther away from destroying you instead of the shorter word that is close to you. The clutter of the words sometimes can also ruin that because you have to stop and try and see what you need to type. But don't think I don't recommend this game. I still felt that it increased my typing speed, and there is just something so satisfying about hearing the blasting sounds that the game makes whenever you type out a long word. This is also an web browser based game and is also easy to use whenever you have some time to kill. If you played the game on the Wii, you already knew what this game was going to throw at you. But I had not, that last House of the Dead that I played was HotD3 in an arcade that used to be near where I lived. The game is extremely raunchy and the cursing is found in almost every sentence of the game. As well as the game will throw very unconventional words or phrases at you such as: ROFL, LMFAO, or my favorite: You look delicious. 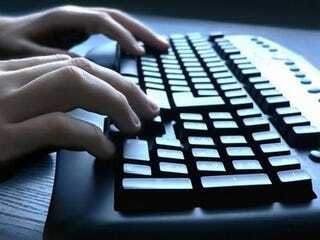 While the game is the most entertaining, it probably isn't the best way to improve your typing efficiency. The game has a few different difficulty modes, but I jumped in with Agent(Normal) first. I found it to be a bit too easy for me, so the next chapter I jumped right into the hardest difficulty that you can play before you finish the game once. This posed much more of a challenge as the sentences and phrases get longer and more complex. Honestly, the premise of this game was enough of a selling point for me alone. Who would've known that I always dreamed that I could slaughter zombies(mutants) with my keyboard? The bosses are pretty great, but some of them I found much easier than dealing with the hordes the level had thrown at me earlier. As well as the final boss allows you to type whatever you want as long as it is within the topic it gives you. So instead of focusing on what the boss is doing, you are focused on typing about whatever the game tells you to. For me, this was a bit of a let down because I always have remembered that the final bosses in House of the Dead were generally always hellishly difficult to defeat. If the ridiculousness of Overkill is a bit to much for you, you can always opt for the original Typing of the Dead. But it might not be compatible with new versions of Windows. So after playing these three games a lot of this weekend I found that my typing speed increased by 25 words per minutes. I have to say it feels pretty great typing faster, and being to type almost as fast as I can think. I hope that these three games will do you some justice and increase your typing speeds and efficiency as well. Here are links to each. If anyone has any other suggestions for fun ways to increase your type speeds I'd love to hear them. I'm shooting for around 100 words per minutes before I will stop trying to get faster. I'm currently at 85 wpm, how fast can you type?